This is what more than a month's worth of free software looks like. 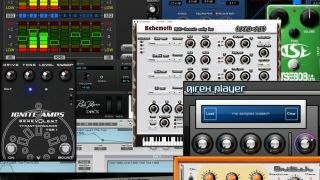 It's been a good while since our last visit to planet freeware, so we've got plenty of new instruments, effects and other music software to brief you on. Get the details below. Ever wanted to turn your Mac's QWERTY keyboard into a MIDI controller? This enables you to do precisely that - we imagine that it could be particularly useful for mobile musicians using laptops. With an appropriate MIDI interface you can even use it to control iOS apps. If you own several Rob Papen synths and want to use them outside of your DAW (as part of a live performance, for example) this standalone Mac-only host could be what you're looking for. It can host RP effects as well, and also boasts audio recording/playback and a MIDI In. Designed specifically for bus compression but suitable for mixing tasks as well, this plugin analyses the output signal and promises highly musical compression and the ability to handle complex signals with ease. Rather than attempting to emulate any classic hardware, it's proudly digital. This tube guitar preamp emulation certainly looks like a real piece of hardware, and it may well sound like one, too. There are two channels and a stereo mode to handle double tracking, with each channel only being activated when a signal is present in order to preserve CPU power. This free SFZ player has been given a bit of a revamp - it now sports a nifty new interface. There's also an automatic volume limiter, improved audio processing and several bug fixes. A loudness meter that helps you to correctly set your tracking and mixing levels. Specifically, it's designed for gain staging, and so gives you both average and peak level meters. If you're unsure what all of this means, you'll be pleased to know that traKmeter comes with plenty of documentation. A 16-voice polyphonic synth that utilises subtractive, FM and additive techniques. It may be free, but it's certainly feature-packed, offering filters, envelopes, LFOs, a 32-step sequencer and plenty of modulation possibilities. This appears to be an emulation of Ibanez's Tube Screamer, and is designed to be used before your amp simulation to give you a tighter low end and add a bit of boost to lead parts. Get yourself a free rack of guitar gear: this plugin includes two amplifiers for guitar and bass plus effects and a tuner. This second version promises improved performance and various other fixes. Another overdrive plugin that's inspired by a particular green hardware model from yesteryear, this one promises additional features that make it suitable for use on extremely down-tuned guitars. A free bassline synth based on additive synthesis. There are four oscillators, and it's designed to create a powerful and punchy bass sound that can be used straight away.